Although much of the world recognises the Republic of Cyprus as an authority over the whole island, Northern Cyprus has declared itself The Turkish Republic of Northern Cyprus and is vastly different in culture and tradition. The culture of Northern Cyprus is a blend of Turkish, Greek and Middle Eastern, which is evident in the music, food and historical attractions. The tourist infrastructure of Northern Cyprus, the area beyond the 'green line', is less developed than the south and the unspoilt countryside and numerous historic sites make a visit worthwhile for those adventurous enough to explore. Historic Gazimagosa (formerly known as Famagusta) on the east coast, for example, dates from 285 BC and has held an important place in Mediterranean history through the ages. The Medieval walls still stand and the remains of some ancient buildings are visible in the old city. Girne (Kyrenia) on the north coast has an interesting castle and picturesque harbour as well as a Shipwreck Museum, which houses the oldest trading ship yet found and raised from the sea bed, having sunk around 300 BC. Gazimagosa has some modern tourist resort hotels, offering luxury accommodation and safe swimming or diving in the Mediterranean Sea, while the dramatic harbour of Kyrenia is the most popular tourist destination in Northern Cyprus. Travelling to Northern Cyprus from the south involves a bit of paperwork. Tourists in Northern Cyprus need to pass through TRNC immigration, which is separate from the visa requirements for the Republic of Cyprus, and the recognised currency in Northern Cyprus is the Turkish Lira. 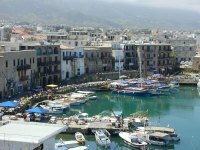 Getting to Northern Cyprus is not difficult however, as there are regular flights and ferries from Cyprus and the mainland.